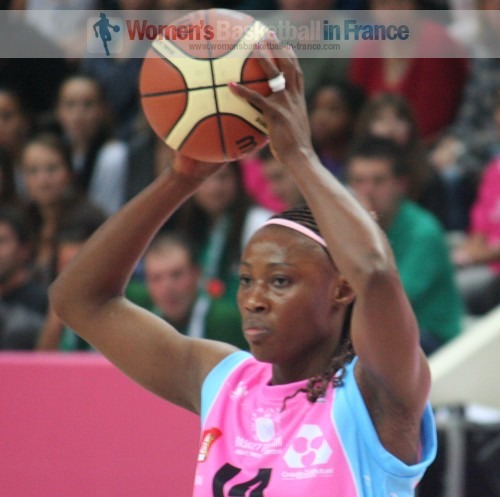 The FIBA Europe EuroCup Women derby of the North of France went to Arras (58-56). Villeneuve, trailing by 10 points after the first game, opened this match with the first 7 points to the delight of the home supporters. Arras pulled themselves together. With Pauline Akonga N’Simbo (in picture) in excellent form (22 points and 14 rebounds) they made up the deficit to lead briefly by the end of the first quarter (14-13). Carla Thomas was unstoppable at both ends of the court as Villeneuve regained control. They opened up an 11-point advantage (34-23) with 19 minutes on the game clock. However Villeneuve lost the aggregate going into the locker room (34-25). After the break Villeneuve were unable to maintain the momentum despite going 11 points clear midway through the quarter. As a consequence of poor defending their lead dropped to 3 points (45-42) going into the final quarter. Arras kept on chipping away at the deficit and with seven minutes left to play they went into the lead for good. They won the tie (58-56) and the series (134-132). Nantes-Rezé had to wait until the third quarter to get the better of their guests from Hungary, Seat Györ. The Hungarians were without Essence Carson but were led by 16 points from Ieva Kublina. Nantes were handicapped as Emilija Podrug was unable to play and Caroline Aubert who was not very well managed just ten minutes. Sonja Kireta with 10 and Mame-Marie Sy-Diop with 14 points controlled the paint while Mélanie Plust and Joyce Cousseins-Smith kept the speed. Exuberance did the rest as Nantes won the match (74-58) and the series (144-126). Energa-Torun's EuroCup Women season is over despite winning the second leg against Gran Canaria (68-63). Gran Canaria were leading (58-51) with 90 seconds left to play. Then they gave their supporters a fright as the guests came storming back. However with a 5-point lead from game one they won the series (128-126).